The Pod Deluxe rental van is set up so that you will have everything you need to camp. There is a cassette toilet, and a sink with a pump faucet for cold water, a gas cooker, camping chairs & a camping table, thermal lined curtains, kitchen utensils, pots & pans and a chilli bin - All You Need For Camping! Plus the seating in the back folds down to make a genuine queen sized bed at night. There is plenty of storage underneath the seats or bed, so you will have no problem fitting packs or soft sided bags. Certified as Self-Contained, so permitted to free camp in designated areas. Some models are manual and some are automatic transmission. If wanting an automatic model, please request. Hi-Way Runner campervans are based on the latest model Toyota Hiace 2012 - 2017, (fitted out in 2017 - 2018). Super smooth with Toyota VVT-i petrol engine, automatic transmission makes for easy car like driving, offers an ultra modern, stylish and compact campervan. Seats 3 (centre lap belt only), but only a double bed (or 2 narrow single beds), basic cooking facilities, sink with cold running water, 12v fridge and 12v lighting, porta potti (with chemicals). All linen, cutlery and crockery provided. 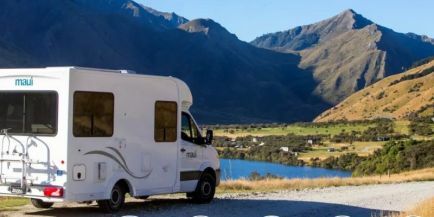 Certified as self-contained which allows you to free camp in designated areas in New Zealand.